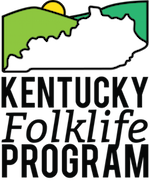 In early 2014, KFP began working on a set of exhibit panels discussing Kentucky’s white oak basket-making tradition. Funded by a recently awarded NEA ArtWorks grant, these free-standing, 3′ x 7′ retractable panels incorporate images of basket-makers, their work, and the life narratives of these artists to help contextualize this important local tradition for a wide audience. To enhance the project and provide an even greater understanding of this important regional tradition, we have written additional funding into the grant to bring basket-makers into each library location for hands-on demonstrations and discussion about their work. These six panels, previously in Glasgow at the Mary Wood Weldon Memorial Library, have moved on to the Taylor Co. Public Library, where they will stay through the first week of August. Beth Hester of Basket Maker’s Catalog will join the library at 5:30 p.m. on August 6 for a lecture and workshop. The lecture portion is open to all, but the hour-long workshop is limited to 20 participants. Contact Jessie Harden, Adult Services Librarian, at jessieharden@tcplibrary.org to register.